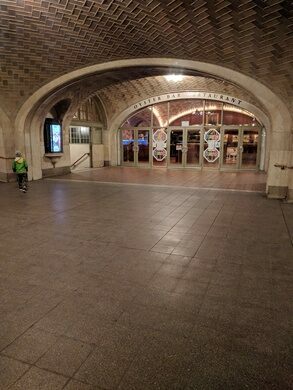 Stand with your ear right up against the tile work in the domed intersection of walkways on the lower floor of Grand Central Terminal and you’ll discover a secret: a corner-to-corner whispering gallery. Even the quietest sweet nothing, soft song, or whispered threat can be heard, even over the din of crowds. This remarkable acoustic oddity is caused by the unusually perfect arches that compose the gallery. The distinctive tile work in the gallery is known as “Gustavino” tiles, named for the patented material and methods of Spanish tile worker Rafael Guastavino, whose meticulous work and herringbone patterns can be admired here and elsewhere in the city. In 2012 the tilework was slated for a restoration, with promises abounding from the MTA that the work would not disturb the cherished acoustic anomaly. Neither a common nor a super rare phenomenon, whispering galleries exist around the world, both accidental and intentional. A particularly lovely example can be found in the dome of St. Paul’s Cathedral, London. Located near the Oyster Bar restaurant on the lower level of the Terminal.